Vision: A thriving iSchool, known for exceptional student experiences and outcomes, societally relevant faculty research, alumni and community engagement, and faculty/staff work environment; recognized within UBC as an essential hub for vibrant, multi-disciplinary, cross-campus collaboration in the areas of archives, records and information management, human-computer interaction and design, Indigenous information initiatives, cultural informatics, digital media and media studies. Identity: An iSchool with an Arts Perspective: (Information, Technology and People) + (Media, Design and Culture). Mission: Through innovative research, education and design, our mission is to enhance humanity’s capacity to engage information in effective, creative and diverse ways. The iSchool mission is grounded in a fundamental belief in the value and importance of information and records to the lives of individuals, communities and society more broadly. Current and future access to information and records in their many manifestations is essential as a means of preserving and shaping memory and culture, enabling democracy through evidence, accountability, transparency and education, and supporting almost all forms of human activity. In order to ensure that individuals and communities are able to engage (i.e. confront, experience, challenge and use) information, the iSchool develops and disseminates theoretical and applied knowledge concerning the production, management, storage, preservation, access and use of information and records and educates students as information professionals and researchers. We acknowledge that no single perspective on the complex and situated concept of information is sufficient or universally valid and we respect and welcome diverse and critical perspectives that enrich our understanding and our practices. 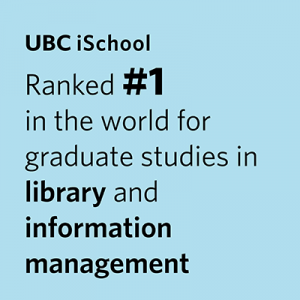 In this work, the iSchool is committed to furthering the goals of the Faculty of Arts and UBC and supporting the many scholarly, academic and professional associations dedicated to the fields of library, archival and information studies. Our membership in the iSchools Organization signifies an explicit commitment to the notion expressed in the iSchools Charter, that “expertise in all forms of information is required for progress in science, business, education, and culture. This expertise must include understanding of the uses and users of information, the nature of information itself, as well as information technologies and their applications”. Goal 1: To promote a thriving, responsive and diverse iSchool community. Goal 2: To foster educational experiences that enable our graduates to advance their fields of knowledge and practice. Goal 3: To conduct innovative and meaningful research that informs practice, extends theory and addresses challenges of societal importance. Goal 4: To build and sustain reciprocal and meaningful relationships with diverse groups of researchers, professionals and community members. Reinforce the reputation and identity of the iSchool to external partners and the broader community. Continue to strengthen alliances within the Faculty of Arts and the University that increase the campus-wide visibility of the iSchool. Develop and implement a comprehensive recruiting plan to encourage and support high-quality applicants, especially those from under-represented communities. Develop an equity and diversity statement and associated action plan that reflects iSchool values and goals. Offer complementary curricula that are aligned with the iSchool Graduate Competencies and responsive to the needs of the associated professional communities and potential employers (MLIS/MAS). Continue to strengthen and support pathways and concentrations that enable students to specialize in areas of interest and prepare for a broad range of careers. Foster an intellectual milieu that stimulates a positive commitment towards the professions, scholarship, and life-long learning (MLIS/MAS). Expand commitments to undergraduate education to increase the impact and visibility of the iSchool and support recruitment to its graduate programs. Sustain reliable processes of community input, assessment and planning at course, program and school-wide levels, including implementation of a program-level capstone assessment. Increase the level and quality of technology-enhanced learning and strengthen student outcomes relating to technology use. Provide clear teaching expectations and development opportunities for adjunct faculty. Nurture a culture of inquiry within the school, both informally and formally, through ongoing commitment to research-focused activities for graduate students and faculty. Sustain societally relevant research agendas leading to scholarly publication and knowledge exchange. Increase the level of support for faculty to establish research groups and partnerships and to acquire external research funding. Increase public exposure to iSchool research through communication and social media channels. Goal 4: To build and sustain reciprocal and meaningful external relationships. Establish and sustain an iSchool Advisory Board. Maintain ties with library, archival and information-based associations in British Columbia, Canada, and internationally. Reinforce core values of reciprocity, social responsibility, and professional ethics in teaching, research and service commitments. Encourage student engagement in scholarly and professional communities. Provide leadership in cross-campus research initiatives and collaborations. Initiate and develop collaborations with international academic institutions.